IS ENERGY CONSERVED AS THE PENDULUM SWINGS? 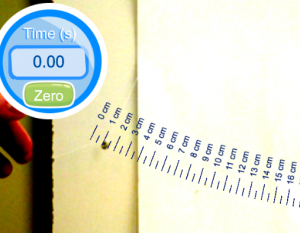 In this video, a 0.004 kg nut hanging by a thread is pulled to the side and released. The video shows one complete swing cycle, and tools are provided so that students can measure the height and the speed of the nut as it swings. Because of the low frame rate, students must interpolate between the frames to determine the height of the nut at the specified locations. The app for this video has a simplified interface without automated plotting or graphical analysis tools.